VATICAN CITY (CNS) — Presenting Pope Francis’ new encyclical and acknowledging how much of it was prepared by retired Pope Benedict XVI, top Vatican officials hailed it as a unique expression of the development of papal teaching and unity in faith. 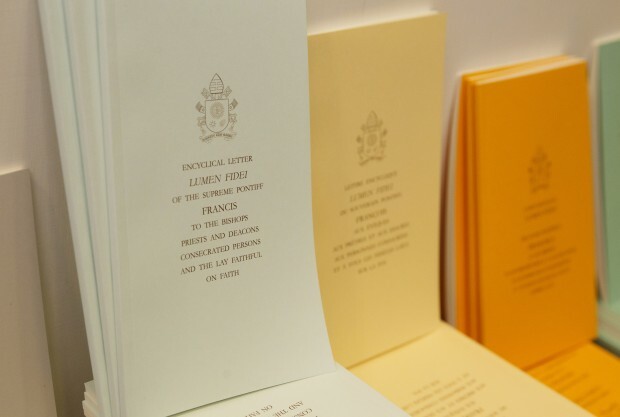 “It is a fortunate coincidence that this text was written, so to speak, by the hands of two popes,” said Archbishop Gerhard Muller, prefect of the Congregation for the Doctrine of the Faith, at a news conference July 5 marking the release of “Lumen Fidei” (“The Light of Faith”). “Notwithstanding the differences of style, sensibility and accent, anyone who reads this encyclical will immediately note the substantial continuity of the message of Pope Francis with the teaching of Pope Benedict XVI,” the archbishop said. Archbishop Muller, along with Cardinal Marc Ouellet, prefect of the Congregation for Bishops, and Archbishop Rino Fisichella, president of the Pontifical Commission for Promoting New Evangelization, emphasized not only the collaboration of the two popes, but their shared view of faith as a “common good,” a gift that is transmitted and nourished by the church, but is meant to be shared with all humanity. Christians have an obligation, they said, to help others by proclaiming the Gospel, but also by living their faith in order to transform the world into a place of authentic brotherhood and care for the weakest. 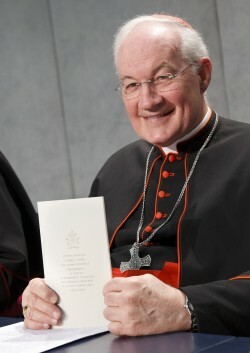 For Cardinal Ouellet, the encyclical’s “shared mode of transmission illustrates in an extraordinary way the most fundamental and original aspect of the encyclical: its development of the dimension of communion in faith,” of the importance of believing in and with the church and of living one’s faith in solidarity with others. Archbishop Fisichella said Pope Benedict “was not convinced he had to undertake the effort” of writing an encyclical on faith, but so many people insisted that he decided to write it and offer it to the church at the end of the Year of Faith, which concludes in November. “History had another idea,” the archbishop said. Pope Francis teaches that the light of faith “offers us human beings a hope that gives us the courage to journey together toward a future of full communion,” he said.